If you have an opinion, insight, or any reason to blog about the current events in the Middle East, and you blog in Hebrew or any of the Arabic languages, you can do so with the full version of WordPress or WordPress.com. With WordPress.com, you can blog for free. With the full version of WordPress, WordPress is free but you will need to pay for your own hosting site. To get a free WordPress.com blog, apply for your free WordPress.com blog here. The only requirement is a valid email address. To download the free full version of WordPress, get the latest version from the Download WordPress page. The official name of your blogging language. The character encoding format for your blogging language. The official name of your blogging language is pretty easy. If you speak French, then it is “French”. But if you speak Indian Arabic, it is officially called “Urdu”. English has different versions, too, including UK English, US English, and Australian English. For the specific “official” name of your language, see GNU Country Codes and Code for the Representation of Names of Languages. In WordPress.com, to set your blog’s primary language, on the WordPress Administration Panels, go to Options > General > Language and click on the pull down list to choose your language. For most languages, you will see the language name both in English and the specific language characters. Click Update Options to apply the new language. There are a few things you need to know about blogging in a foreign language on WordPress.com. While you may have access to your WordPress Theme template files in the full version of WordPress, with WordPress.com you don’t. You can only choose from the WordPress Themes available via the Presentation tab. Most WordPress Themes are set up to be localized, which means they should change the sidebar titles like categories, Pages, and other default headings to the language of choice, but not all WordPress Themes are coded to do this automatically. Therefore, some WordPress Themes will feature English by default in some areas of your WordPress.com blog. All of your posts, post titles, widgets, and links you write in your language will appear in your language. If you are using a right-to-left language, like Hebrew and Arabic, WordPress Themes which feature bits of code such as the sidebar headings for categories with the feed link or number of posts in that category may find themselves reversed. Instead of WordPress Tips (120) (RSS), it may say (120) (RSS) WordPress Tips or some backwards version as it struggles to deal with the right-to-left issues. A properly coded WordPress Theme that takes localization into account should not have this problem, but that is dependent upon the good coding practices of the WordPress Theme author. For more information on international versions of WordPress and localization, see WordPress in Your Language, Installing WordPress in Your Language, and Translating WordPress. For examples of WordPress.com blogs in Hebrew and Arabic, see the WordPress Blogs of the Day in Hebrew and WordPress Blogs of the Day in Farsi, Türkçe, and Arabic. Have I missed any language groups for the Middle East and related areas? While the situation is horrible, it is exciting to see international bloggers blog in their language. Many fluent in English and their native language are blogging in both, offering a translation on each blog post or a second translated post on the same blog, or even setting up two separate WordPress.com blogs, publishing the same posts but in each separate language. Amazing. So if you have something to say in another language about what it going on in the world around you, get blogging in your language! If you are interested in helping WordPress become more international, WordPress.com recently announced “Translate WordPress”, a new site and service requesting help from multi-lingual speakers to help translate WordPress elements in different languages. If you are fluent in English and other languages, and you have some programming experience, please volunteer and help as much as you can. You can also help translate WordPress by helping to develop localization files for different languages. The more the core titles, headings, and programming language of WordPress is translated into every language, the more international bloggers can take advantage of the power of WordPress. This entry was written by Lorelle VanFossen and posted on July 17, 2006 at 11:13 am and filed under WordPress, WordPress News, WordPress Themes, WordPress Tips, WordPressDotCom with tags how to use wordpress, wordpress, wordpress help, WordPress News, WordPress Themes, WordPress Tips, wordpress tutorials, wordpress.com. Bookmark the permalink. Follow any comments here with the RSS feed for this post. Post a comment or leave a trackback: Trackback URL. Actually, the real problem with WordPress.Com and Hebrew (or Arab for that matter) is the writing direction. As you know, Hebrew is written Right to Left and WordPress.Com templates aren’t supporting that. It’s also preferable to write Hebrew in UTF-8. The translated version of WordPress in Hebrew is encoded UTF8 completely. Thanks for the input, Sarit. There are a lot of Hebrew and Arabic WordPress.com blogs. How is it working for them with the right-to-left issue? Is there a specific Theme that will work for these languages? Any recommendations? The Hebrew blogs I saw on WordPress.Com didn’t have a correct writing direction. I think the ones writing with the wrong wiritng direction don’t see it as a problem ;). Fitting a template to right-to-left usually depends on the CSS file and “direction:rtl; text-align:right” to many of the divs. Melly is a Canadian blogger who went to Israel during the crisis to be with her family. Please send her good thoughts about coming home safe. Not sure how much longer she will be able to write entries. While Israel may have a lot of third world characteristics, they are more technologically advanced than the US when it comes to communications. Everyone has two to three cell phones which handle Internet well. So as long as there is a cell signal, if the incentive is there, communication will get out of the country. All our thoughts are with our friends there, on both sides of the battle. Sad stuff, but unfortunately, necessary to finally move towards an end…I hope. Hi Lorelle, thanks for this helpfull article. Could you tell me if it would be possible, simple to publish a blog both in English and in Hebrew? I know some are doing it, but how, I’m not sure. I think the core setup needs to be in Hebrew and then you just use English characters to write the English posts. Check with them or on the WordPress.com support forum for details. And let me know what you find out! Hi Lorelle, firstly thank you for all of your hard work, this site is really helpful but unfortunately pretty hard to follow if you’re someone like me who is horrible at anything technical. Secondly, I tried downloading the Arabic version of wordpress and failed at installing it properly, mainly because the config file gave me a bunch of weird symbols instead of either English or Arabic text. I tried numerous times and went through every step carefully, but I can’t seem to find where my problem is. Thirdly, seeing as most tutorials are outdated, I can’t find something both useful and easy to follow regarding wordpress in Arabic. I downloaded plugins that translate text, but they don’t work the way I want them to. I’ve been working at this for over a week. I’m losing patience but I don’t want to give up, despite the fact that I’m clueless. Would you be willing to help me in downloading and installing the latest Arabic version of wordpress on my site? No, sorry. The invitation above was for WordPress.com, which is simple and easy to use. For full version sites, I’m not familiar with what is available to help. I have heard, however, that members of the WordPress Support Forum are helping with installations, so you might ask there. As for why the config file gave you weird symbols, my guess is that you were not using a TEXT ONLY editor. You cannot open it or save it in WordPerfect, Word or any other word processing program. You can, however, read it in notepad in Windows or with other text editors as suggested in Free Text Only Editors for Templates, PHP, HTML, CSS, and More. The tutorials are not outdated. They are updated constantly. If you could be more specific, then I can immediately make sure that whatever tutorial you are talking about is checked and updated, but they are up to date. That’s part of my job. I know this is difficult, but make sure you are using a text only editor and check in with the WordPress Support Forum for more help. They are great folks there. I wasn’t referring to your specific tutorials. There are tons of other tutorials found through Google (and even old threads in WordPress support) that only apply to a limited amount of wordpress versions, I’m not sure why the latest versions work as properly as older versions when it comes to many plugins. As for the config file, I did open it in notepad. Same problem despite the number of times I had to re-download and unzip the files. Anyways, thanks for your help. I’m off trying to figure this out. The Arabic tutorials assume that you know too much, and I have no way to get in contact with the writers to ask them for further help and clarification. Comments often go unanswered. I hope in the future there will be better services, especially for the many non-English speaking writers who can’t figure this out. I wasn’t talking about my articles but the tutorials and instructions in the WordPress Codex, the official online manual for WordPress users. Sorry I wasn’t more clear on that. I don’t know if it is updated, but the official Arabic WordPress Support site is at WordPress-AR.SourceForge.net. You can find more information at WordPress in Your Language and Installing WordPress in Your Language. There are many Arabic users of WordPress. And the installation of WordPress has nothing to do with Arabic, but English. If you follow the Installing WordPress instructions and then make the specific changes after installation to make WordPress work in your language. I know it’s frustrating, but millions of people in a variety of languages have succeeded at this. The WordPress Support Forum is your best bet, and I know they have Arabic speakers there who might be able to help, especially if you are specific in your request. Is there any translation to Japanese or Chinese? If you have your own domain, most probably – when you log in to your CPanel (where you can manage your website)- you will have something there called (Fantastico), click on it and under *Blogs), you will find WordPress there, then you are ready to go by just clicking on (Install). You can double check on that. 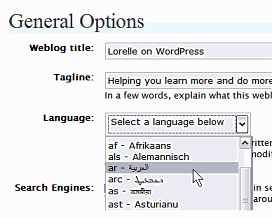 I am not sure if you want to blog in Arabic, but it is now doable in WordPress and once you set the language to Arabic in the General Options tab as explained above, everything will be right aligned and fine. That being said, if you plan to publish posts in both Arabic and English, then all English posts will be right-aligned if you have Arabic set as your main blogging language. I hope this helps. If not, please let me know and I will do my best to help. Eid Mubarak to you and your family inshaa Allah. While that is mostly true, many web hosts do not have CPanel or Fantastico. Many still have to install WordPress without them. Also, this article is about blogging with with WordPress.com, not the self hosted version. WordPress.com is set up to easily handle Arabic, Hebrew, and other RTL languages, in addition to Esperanto, many African languages, Russian, Chinese, Japanese, Croatian, and many other languages. The language is activated upon registration. I previously blogged on tumblr but decided to migrate to wordpress. I installed wordpress via fantastico successfully, however, I have not been able to import all my blog enteries via xml, noteably, all my hebrew and arabic enteries appear as question marks. Initially I thought it was a problem with wordpress. I tested this theory and on wordpress.com and it works there… So something, it appears, is missing in my installation of wordpress on my website… Are there any language files I need installed? Did you check out the articles on the WordPress Codex on how to use multi-languages with WordPress? You will probably have to use a multi-lingual WordPress Plugin to help with some of these issues. See Translation and Multilingual WordPress Plugins and Blogging in More Than One Language for more helpful advice. Remember that WordPress.com and WordPress.org are two different animals and you have to be very clear about which one you should ask which question for. WordPress.com is set up for all types of languages, but you have to choose ONE, not many. Single hosted versions of WordPress can be set up to handle more than one language. The issue is a combination WordPress and WordPress Theme. The Theme must be enabled and identify itself by language to the browser in order for the browser to display the right character set, and WordPress must know which character set you are blogging in during the installation phase. It must be set up in the wp-config. It’s tough to work in more than one language, so I recommend you have a single hosted version of WordPress and use a Plugin to make it easier. I want to thanks u for such a gr8 help.. I have facing a problem with the same in hebrew language blog.. i have changed the language code ..